Mexico are now through to the knockout stages thanks to South Korea, and the Mexican fans look extremely grateful. As the World Cup drama continues on field, off the field, two World Cup team's fans came together today to show each other some love. In fact, "the beautiful game" just became the cause of one of the most epic fandom collaborations since Beyoncé and BTS stans formed the #ArmyHiveProject. According to Remezcla, BTS have gone straight up the Mexican iTunes Charts since South Korea's shocking 2-0 win against Germany in the last round of today's World Cup group stage matches. This win for Korea sent the Germans crashing out of the tournament, which ultimately saved Mexico in the process. Mexico fans have since erupted into sheer elation online, tweeting out nothing but love and praise for South Korea. It looks like the Mexican national team fans have been playing BTS pretty much nonstop in appreciation for South Korea. 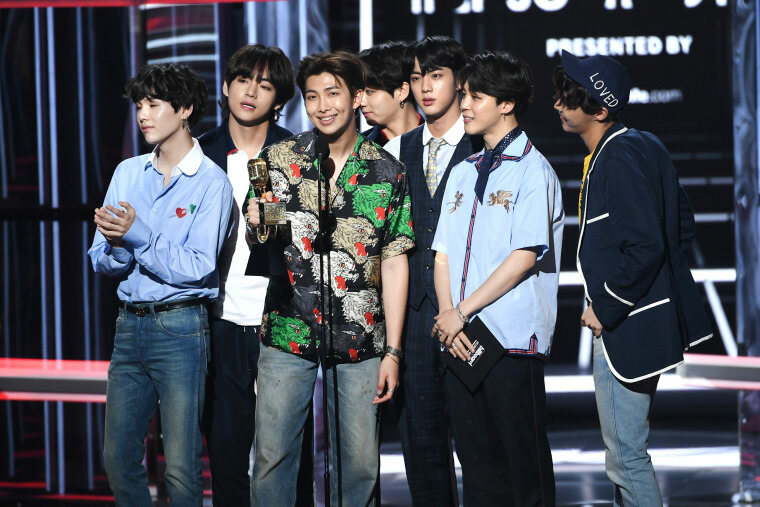 Remezcla's article also reports that BTS's new song "Fake Love" has climbed 31 spots on the chart. Take a look at some loving tweets from the Mexican fans below.